This is a fine old French Professional quality copper cooking pot with a heavy cast iron handle. 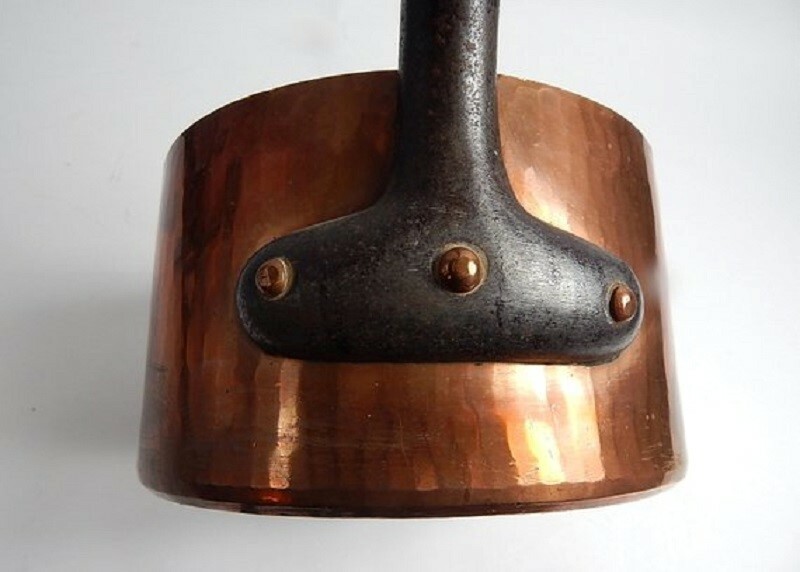 This copper pot has been artisanally formed by beating a sheet of copper into this pot shape with no seam. The marks of the makers hammer can be seen in the photos. This pot has the impressed number '26'. This cooking pot with sides of the desired 2.5 mm thickness, measures approx. 10 1/4 inches in diameter by 6 inches deep. It is 20 inches long with the handle. It is super heavy weighing about 5.3 kilos. Even with the wrought iron handle that's a lot of copper! If this pot were to be used, the tin lining would need to be renewed, (see our recommended source below), or it is just wonderful decor for a French-style home or professional kitchen. This pot is in excellent vintage condition with no dents or verdigris. Although it appear to have been give a light polish not too long ago, it would enjoy a refreshing polish to shine beautifully and to remove any residual tarnish. For re-tinning in the UK we recommend the following companies which have re-tinned other copper items purchased by several of our customers. You can obtain an estimate from them by sending our description and several photos. . Shipping from France for this heavy item will be £42.50 to Europe and the UK. Your parcel will be professionally packed. Shipment will be by French Colissimo International Airmail which includes insurance, a tracking number and delivery on signature for added security.